JACKSONVILLE, Fla. - A Jacksonville mother sent a warning to other parents after she said her toddler's favorite Christmas gift turned into an unexpected hazard. 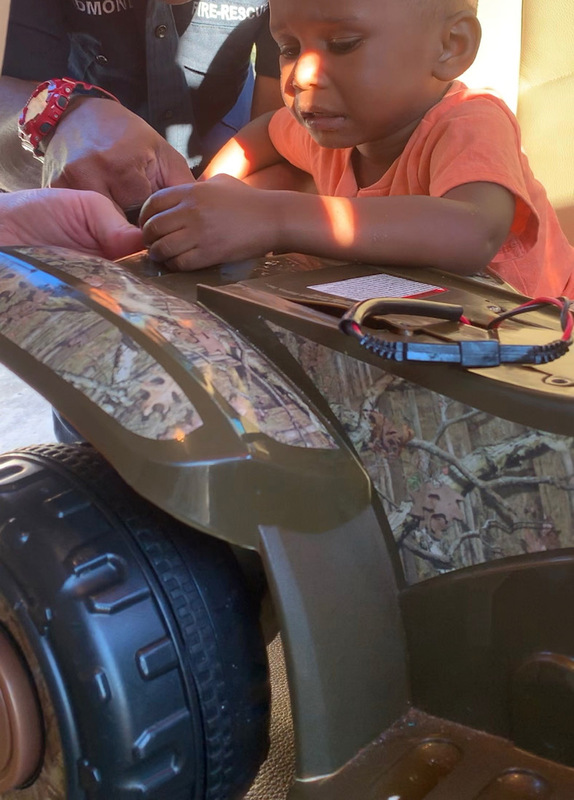 Candice Ketter shared a photo showing her 2-year-old son's thumb stuck inside a hole on an electronic four-wheeler toy made for children between 18 and 36 months old. Under the seat of the toy, there's a battery and cable. Ketter told News4Jax on Monday that the toy was charging last week when her son, Javion, stuck his finger in the hole that locks the seat to the base. "I was panicking because, at first, I was, like, 'OK. His finger is stuck. Let me go pull his finger out of this hole,'" Ketter recounted. "Then I started to pull it. It wouldn't budge and then he started to cry and I was, like, 'Uh-oh.'" After trying to use olive oil to slide Javion's finger out, Ketter went to the fire station right around the corner. Video captured firefighters cutting through the plastic and, after about 10 minutes, getting the boy's finger out safely. "I don't want any other kids to go through what my son went through," Ketter said. After the scare, Ketter reached out to News4Jax because she said she wants to warn other parents about what happened to her son so they can look out for similar hazards in their children's toys. "Just to be aware of what your kid is playing with. Even though we think the toys are safe that we buy, as a parent, you might want to check and inspect it further just to make sure," she said. "Every toy I buy, I am going to make sure I inspect it before I let my child play with it because that was pretty scary." The safety of children is always our number one priority, and we take product safety issues very seriously ... Our product safety team is currently looking into this matter and will make recommendations if remedial measures are warranted. There have not been any recalls related to this product."